In the Middle Ages the Bible was the subject of most learning and writing because it was the basis of Christian theology. It provided the foundation of study of history, science, and language as well. The Book of Genesis was especially important because it told of the beginnings and the human fall from grace. By the 12th century, biblical commentary had developed into a complex body of knowledge which still had to be redigested in order to deal with changes and new issues. Theologians coped with the difficulties by dividing knowledge into categories and organising it as units. Their books reflected these changes in their graphic layout. 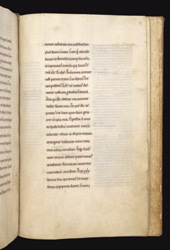 This copy of Genesis has an extensive gloss or commentary, but instead of writing the gloss between the lines or in margins as had been done earlier, the main text is written in a narrow column in the centre of the page with the commentary on either side and above. This page, however, presents the end of Genesis 44, where Joseph has his silver cup put into Benjamin's sack of grain. For some reason, no commentary texts were added to the page, and this was planned for in its layout. In the right margin, corrections to the text in a kind of early pencil called metalpoint (using lead or silver) are visible. The plainness of the page reflects the ideals of the Cistercians, the order of monks who built the great monastery of Rievaulx. While they did not reject beauty--they understood an austere aesthetic--they objected to opulent decoration as distraction.